Born in 1964, Yukihiro Isso is a Japanese Noh flutist (hayashikata fuekata) from a family that has been playing this instrument since the 16th century. He received his initial instruction in flute playing from his father Yukimasa Isso and performed on the Noh stage for the first time at the age of nine. From his middle school years he began to listen to a variety of different kinds of music and studying new instruments including the recorder, flute and piano. An acclaimed performer of classical Noh repertoire, Isso is also an accomplished improviser and has performed with the likes of Cecil Taylor, Peter Brötzmann and John Zorn. Born 1946, Roger Turner grew up amongst the Canterbury musical life of the 1960’s with a strong jazz foundation. Since 1974 his work has been concentrated on exploring a more personal percussion language through the processes of improvisation. Solo work, collaborations with experimental rock musics & open form song, extensive work with dance, film and visual art, involvements in numerous jazzbased ensembles, & workshop residencies have formed part of that development. 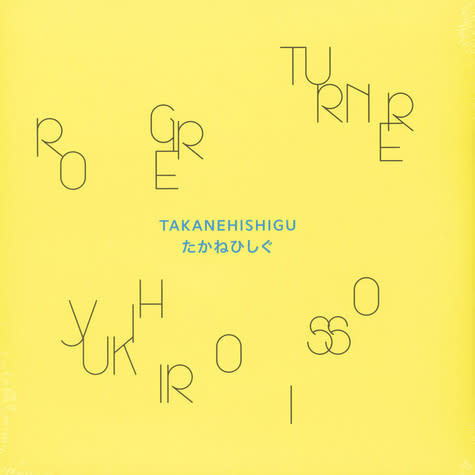 Takanehishigu is the audio documentation of the first time these artists played together. The results are a breathtaking new music which remains respectful to the individual traditions whilst simultaneously subverting them. Takanehishigu was recorded live at Cafe Oto on 23rd Sep 2016 by Shaun Crook, Mixed by John Chantler. Mastered by Giuseppe Ielasi. Artwork by Paul Abbott. Edition of 500 copies.